Thanks for the pics. I think I'm going to need to get a set of those droids. Added another photo to my last posting, to show the figures' scale with other droid figures. Those Disney exclusive BB droids are pretty amazing! I am really curious about this wobble feature. I didn't realize they had a rounded base unlike the Hasbro versions. The wobble feature is interesting in that the droids have rocking motion with the slightest touch. This is better than the Hasbro static version, which does seem more like an accessory than a figure, for the most part. These BB units are weighted in the bottom like the Sphero BB-8. BBs wobble, but they don't fall down. Three Walmarts, 3 Roses each. Everything else, gone to the scalpers. Ladies and gentlemen, your new Constable Zuvio. There is no reason for this figure to be in this wave. bassbone1 wrote: Three Walmarts, 3 Roses each. Everything else, gone to the scalpers. Ladies and gentlemen, your new Constable Zuvio. There is no reason for this figure to be in this wave. Agreed completely. The Zuvio comparison is ridiculous. She'll do fine. I think it's great that this character was released so early. She's going to be a major part of the new movie and I'm always excited to get something new and interesting than just a variation on what we had before. As someone who got seriously sick of endless trooper repaints during the Prequel/Clone Wars era, nothing interests me less than yet another slightly modified trooper. I have no walmarts in my area so I can't comment at all on her availability in the black series. But her basic figure is selling as briskly as any of the other characters with the exception of Luke. So here's to Rose. Lance Quazar wrote: As someone who got seriously sick of endless trooper repaints during the Prequel/Clone Wars era, nothing interests me less than yet another slightly modified trooper. And lets not forget that we got a ton of Trooper repaints with TFA and Rogue One as well. Hell, most of the time they didn't even bother to do a repaint, and just added a different color plastic shoulder pad on the trooper. I assume she will be the Lando of the ST. She comes in during the second movie and remains a main player through the third film. And she will pegwarm just like Finn. I like the Rose figure. The sculpt is perfect, the articulation is great, and the paint scheme is really well done. I'd give this figure 9/10 - only because I think they did a better job on the face/head on the 5poa version as compared to this. I agree that she's not as hot of a figure as Luke, Stormtrooper and Praetorian Guard, but she's still a kickass figure. I think we could see some pegwarming like Finn however, but not as bad as Zuvio (and hopefully not quite as terrible as Finn). Oh, and she's an army builder too in a sense. Easy head swap --- AND soft torso, so you can pop those arms out easily for customizing. So that helps right there in sales (soft torso is how ALL the figures should be made). 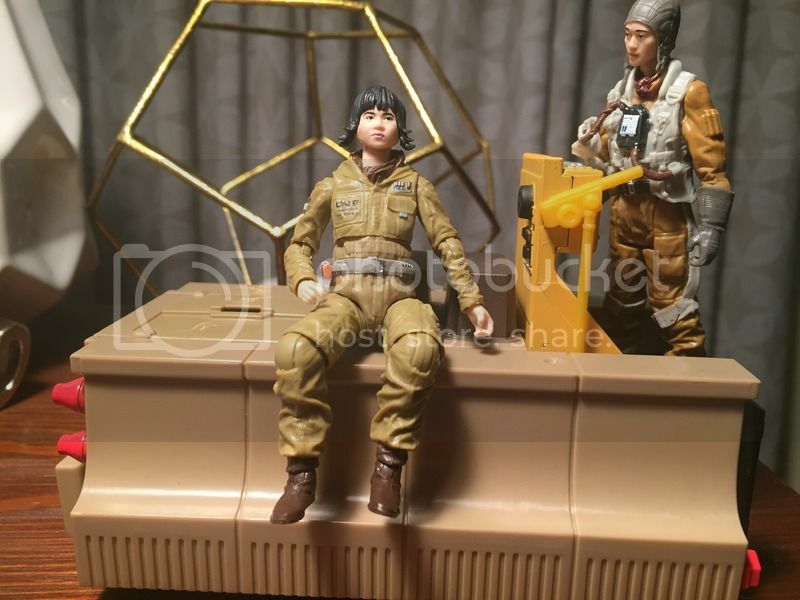 That being said - Hasbro probably would have done retailers a favor if she was just 2x per case instead of 3, and inserted another Praetorian Guard. Spotted the new TLJ assortment at WM today and picked up old Ben. They had Yoda as well, but considering he doesn't have leg articulation - I skipped it. I even noticed the basic TFA Luke - first time I've seen him on the pegs. YAK_Chewie wrote: I like the Rose figure. The sculpt is perfect, the articulation is great, and the paint scheme is really well done. I'd give this figure 9/10 - only because I think they did a better job on the face/head on the 5poa version as compared to this. Did you have to drill any? Looks great. YAK_Chewie wrote: Did you have to drill any? Looks great. Nope. At first, it seems like it won't be a fit. But you just keep twisting....it'll get there.